Make the best of your cabinets by selecting a finish that enhances your kitchen style. Painted finishes come in a wide variety of colors. Paint can be used to accent or fully cover the cabinetry. It works best for maple cabinets because the wood is smooth and uniform, but be aware that the natural grain often shows slightly through the paint. Paint finishes chip, hairline crack, and rub off in high use areas. Adding a tinted varnish to natural wood cabinets can create a look that is similar to painted cabinets, but shows more wood grain and is more durable. Staining enhances the wood pattern, but always has a slightly irregular look. Although the variations seem noticeable on individual pieces, when the cabinets are installed, the total effect is complementary and brings extra depth to the design. However, here are fewer choices in stain colors and finish types. Glaze is a finish type that has some color, but glazes are transparent or semi-transparent, so the color is lighter rather than opaque. Glazes are brushed on over paint or stain, then rubbed off by hand so the color remains in the corners, recesses, and imperfections of the wood. Glazing creates a unique look, but it can be expensive. 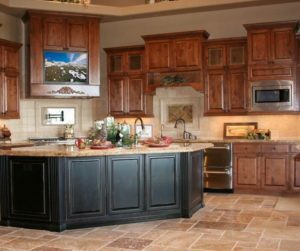 Most cabinet manufacturers finish all of their natural cabinets with polyurethane varnish to make them harder and more corrosion-resistant. Polyurethane varnishes create a glossier appearance. Some green manufacturers now offer a water-based, ultra-violet (UV) cabinet finish that contains virtually no volatile organic compounds, and emits no toxic fumes or chemicals into the air. The look is basically the same as polyurethane and has the same resistance to scratching, heat, water damage, and age-induced yellowing. Installing a thin layer of laminate or thermofoil over the external surface of wood is also a choice as opposed to any sort of treatment to the wood itself. Laminates and thermofoils offer full color and finish options while being virtually indestructible. Our custom cabinets from OakCraft, Shiloh, Eclipse, Aspect, G&L Powers Enterprises, and Timberlake Cabinetry offer a full range of exciting possibilities. We also have custom finishes available.